Shake Shack has walked away from their application to site a store at 1340 Post Road in Darien after deciding there was too much resistance from the Zoning Board of Appeals to their proposed 24-inch-high signs —but there may still be a possibility they’ll return. It’s an utter misrepresentation of the facts that “P&Z wasn’t interested in changing the regulations.” The November 3 tape reveals that we had a long discussion with the applicant over the complexity of the regulations and that it could be a 3-6 month process to change them in a comprehensive manner. Because of the tenant’s desired timeline, it was mutually agreed that the ZBA route might be the best tact to take. Based on the reports from the ZBA hearing, that didn’t render the desired outcome. Ironically, P&Z is going to deliberate other aspects of the application on Tuesday. While I can’t prejudge the outcome, any rationale observer would assume that the two public hearings were favorable for the applicant and the tenant. If the P&Z application ultimately passes, perhaps the tenant can deal with the smaller signage on a temporary basis and I will ensure P&Z addresses the regulation modification on a timely basis. If the point of a sign is to alert people passing by that a business exists in that spot, that point already may have been made in news accounts that a lot of people have already seen. If the Planning & Zoning Commission is as interested in having Shake Shack in Darien as people in town are interested in reading about the possibility, is it reasonable to assume the commission might fast-forward approval of sign regulations to get the restaurant back? 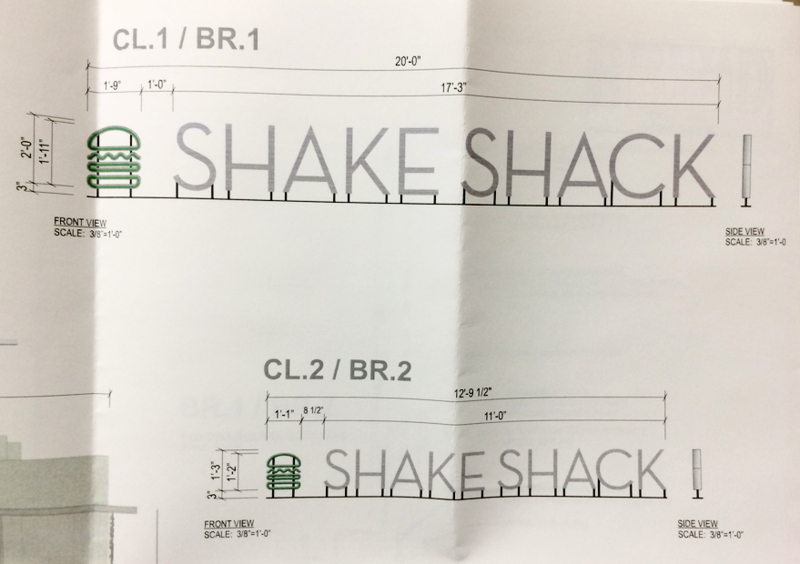 The designs for two of the signs Shake Shack was proposing (from the Planning & Zoning Department file). Darienite.com has left a message for David Genovese, principal of Baywater Properties LLC, an affiliate of which owns the land at 1340 Post Road. Readers should be aware that the ZBA is limited to approving variances to the P&Z legal statutes for applicants who can demonstrate a hardship that comes with the property. Just wanting a sign that is larger, internally lighted or in greater quantities than the P&Z regulations specify is NOT within the discretion of the ZBA without a demonstrated hardship. If a hardship is demonstrated, then the ZBA is authorized to iapprove a variance that relieves the hardship with the “minimum adjustment necessary”. If a variance for a larger than regulation sign is warranted because the legal size is too hard to be seen from the road because it is set far back from the road, then the variance will approve a sign that is large enough to be seen but no larger. Whole Foods edifice is ok but a small Shake Shack isn’t? Not right! Too much power in the hands of a few. Can you appeal? It’s probably gonna be a car dealership or a bank now!!! Bring in five guys! They’re better anyway. A loss for the town…over a sign. Make way for another useless bank. Across the street from a car dealer, in a stretch that has never been all that attractive. Very disappointed–it’s what Darien needs, a good burger with plenty of parking. They let HoJo’s keep the orange roof, so a bigger than usual sign shouldn’t be a deal breaker. Shame. Best news I have heard all day!! 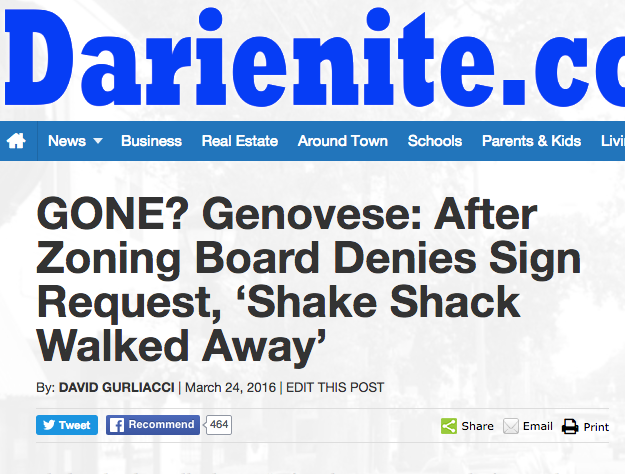 Update, 8:51 p.m., Thursday and 6:12 a.m., Friday: David Genovese, principal of Baywater Properties LLC, an affiliate of which owns the site where Shake Shack will be built, announced that the restaurant has agreed to come to Darien: Shake Shack is a go. We expect to file for building permit next week, to begin construction later this month or in early July and to open the restaurant in the fall.